Painted plywood floors can be beautiful, and depending on the type of plywood and paint you opt for, these floors can help you save quite a bit of money. Whether you’re working on an attic, a play room for your kids, or even a den, dining room, or other living space, you’ll find that painted plywood floors are a practical, stylish choice. One solid color? An interesting check pattern? A muted grey or bright white to open up your space? The options for painting plywood floors are nearly limitless. Before we talk colors and designs, though, let’s go over the basics of how to prep and paint a plywood floor for a smooth, attractive finish. Before you get started, clear everything from the room and be sure that the space is well-ventilated. Survey the floor to ensure that the plywood is firmly attached to the floor joists beneath, and tap down any fasteners that are protruding. Once you’ve finished this preliminary step, you’ll be ready to get started. 1. Install plywood if necessary. If painting a plywood subfloor, clean it thoroughly before moving on to the next step. Check to be sure all plywood is in good condition and consider replacing or fixing any pieces that are in bad shape. 2. Fill nail holes and joints between sheets of plywood with patching compound. Don’t worry too much about neatness; you’ll be smoothing everything down when you sand. 3. 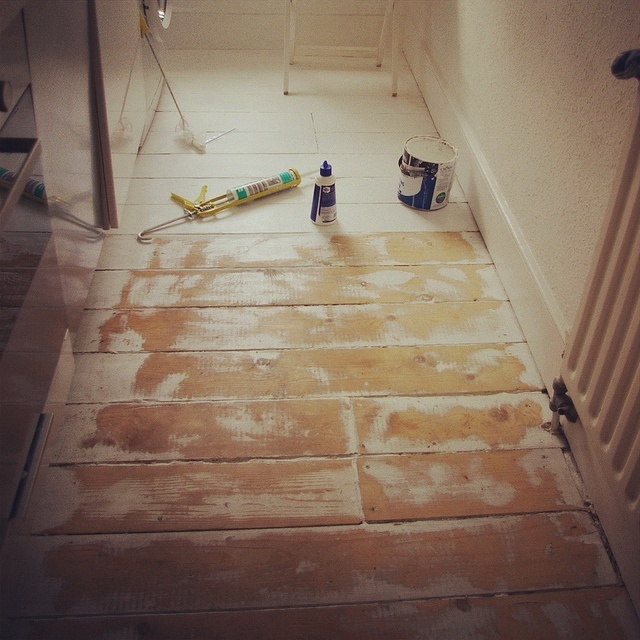 Once the patching compound has dried, start sanding the floor. Work in small sections, vacuuming up the dust as you go. 4. When you are satisfied with the floor’s texture, vacuum the whole thing. 5. Go over the floor with a mop that has been barely dampened, removing the remainder of the dust. You may have to rinse the mop several times, wringing it out well after each rinse. 6. Ensure the floor is free of dust and completely dry before beginning the next step. 7. Using a paintbrush, cut in the edges of the floor with primer. If you plan to apply baseboard molding when finished, don’t worry about taping off. 8. Use the roller to prime the rest of the floor. Work in sections, beginning at the section furthest from the door and working your way out. This way, you won’t find yourself painted in a corner. 9. Allow the primer to dry per the manufacturer’s instructions. Apply a second coat if needed. 10. Once primer has dried completely, it’s time to begin the painting process. It’s often a good idea to lay down a single coat of light-colored paint before stenciling a pattern. If you are working with contrasting colors, lay down the lighter color first. If working with several colors, you may be better off drawing or stenciling your pattern before laying down any paint. 11. Allow your paint to dry completely between coats and colors. Follow the manufacturer’s instructions regarding sanding between coats. 12. Allow the painted plywood floor to dry completely before applying the sealer. You’ll want to apply two or more coats for a durable finish that lasts. 13. Allow the floor to dry for at least two hours before testing to see if it’s dry. Although you will be able to walk on it in sock-covered feet within a few hours of application, you will want to allow the finish to cure for 24 to 48 hours before bringing in rugs, furniture, and other items. 14. Decorate your room and enjoy! So, what about colors? Plain white or cream opens up a space, is fuss-free, and is just about foolproof. It’s a good choice for any space. Other pale colors such as the lightest hues of yellow, green, gray, or even lavender can be nice. Be sure to consider which furnishings, rugs, and art you’ll be using in the room you are painting. Blue is a nice choice too, whether brilliant and playful or subtle and muted. Be careful though; the darker the color, the smaller your space will appear. Neutral beige, tan, and coffee colors work well too. The lighter the color, the more open your room will look. For a more vibrant appearance, try a spicy red or mustard tone. These colors work well in kitchens, studios, and other spaces where creativity reigns supreme. If you’re considering a pattern or stencil for your painted plywood floor, you’ll find that simple checks or diamonds are easy to lay out. You can swirl the paint to get the look of stone, use an interlocking circle pattern, or stencil on another design that appeals to you. Last, but not least, remember that you’ll get the best results with high-quality plywood like ACX or Okoume, but you can paint any plywood floor to give your space a quick update at an average cost of under a dollar per square foot. 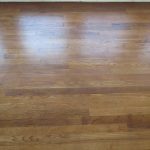 Price will depend largely upon the cost of the materials you choose to use, but you’ll find that even with high-quality plywood and paint, you will ultimately spend less than you would on traditional floor coverings.